Writing, Surviving & Thriving: Check us out! Hey folks! Still drafting blog posts to publish later this week, but in the meantime, check Hubs and I out over here. Hubs and I wrote a 3-part series for the blog NoirLove.com, a blog "dedicated to building healthy and successful relationships for African-American professionals" according to their site. 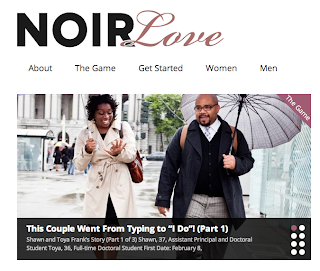 We're sharing a little bit about how we went from online dating to taking a trip down the altar. Until next time . . . be creative about dating if you're looking for someone special. Give online dating a try!